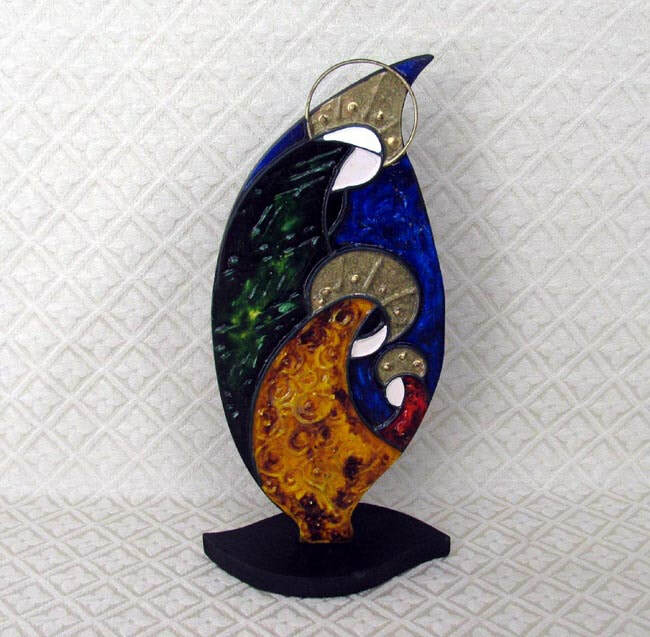 This unique handmade Holy Family appears to be made of stained glass, but it is actually wood that has been painted with a special technique to look like glass. The Holy Family stands 8.5 inches tall. The artist is Yeliptza Pérez, who lives in Valencia, Venezuela. Yeliptza expresses her religious faith by creating artwork that focuses on religious subjects: angels, Nativities, crosses, Catholic saints and virgins, etc. She believes in the motto: En Dios esta mi vida y mis metas que todo se haga bajo su voluntad y su tiempo perfecto [In God is my life and my goals that everything is done under His will and His perfect time].